Bethesda and Sony have canceled the mod-pocalypse. Bethesda ended months of anticipation for Fallout 4 mods on PS4 last month by saying Sony wouldn't allow the company to do user mods "the way they should work," but the two companies evidently reached a compromise since then. PS4 mods will launch with Skyrim Special Edition on the game's release date of October 28, and they'll come to Fallout 4 later on. There's one big catch, though: unlike on PC and Xbox One, PS4-supported mods won't be able to use any new stuff players load into the games. It all has to be assembled from content that's already there, which means no custom Batsuits or Nuka-Cola-firing alien blaster rifles. Far more people use mods than create them, though, so here are some examples of what should still work for you. 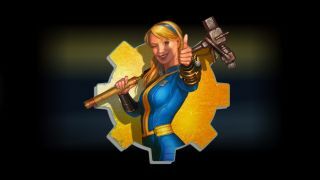 This mod gives you a holotape that you can pop into any computer to activate all kinds of good old-fashioned cheats like god mode, infinite ammo, and weather changes. You can't load anything that didn't already exist in the game, and it just uses a standard terminal interface, so it should be fine for PS4. No longer will you have to choose between Dogmeat and Fallout 4's more powerful (but also way more judgy) humanoid allies. This mod simply lets you take Dogmeat and one other companion with you on your adventures. No new items, no extra voice files, nothin'. If your architectural style keeps getting cramped by your build budget, this is the mod for you. It just changes a handful of variables (by setting them to ludiculously high numbers) so it ought to pass the Sony test. Does exactly what it says on the tin - all the materials you could want, handily stored in an ever-replenishing van near Vault 111. This mod throws a bunch of Fallout 4's usual progression out the window, but it doesn't add any all-new content. Every time you find some Legendary gear, it's a roll of the dice whether it will actually be useful. With this mod (and the right materials and Perks) you can build your own. It's a relatively minor tweak with a potentially massive effect, and it should still work. So you'll still be able to change up your game quite a bit in both Fallout 4 and Skyrim on PS4, even if some of the weirder stuff remains off limits.